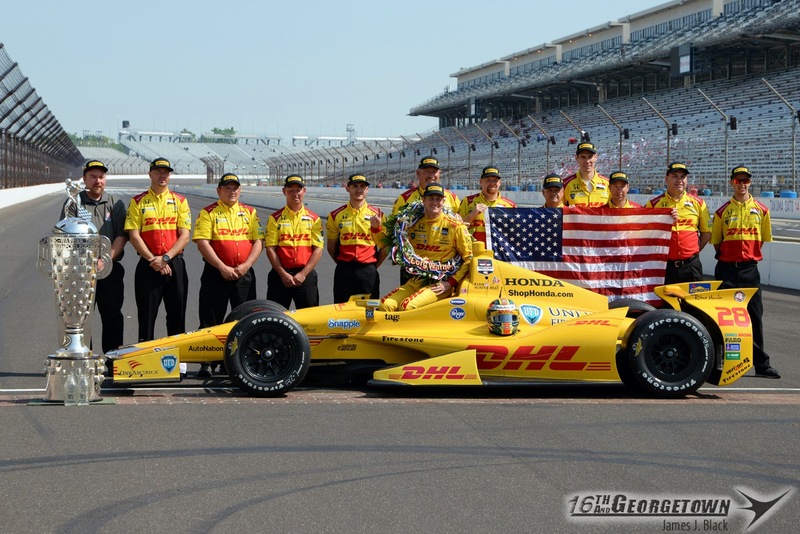 In what was the second closest finish in the 103-year history of the Indianapolis 500, Andretti Autosport's Ryan Hunter-Reay took the checkered for the 98th Running of the Greatest Spectacle in Racing. 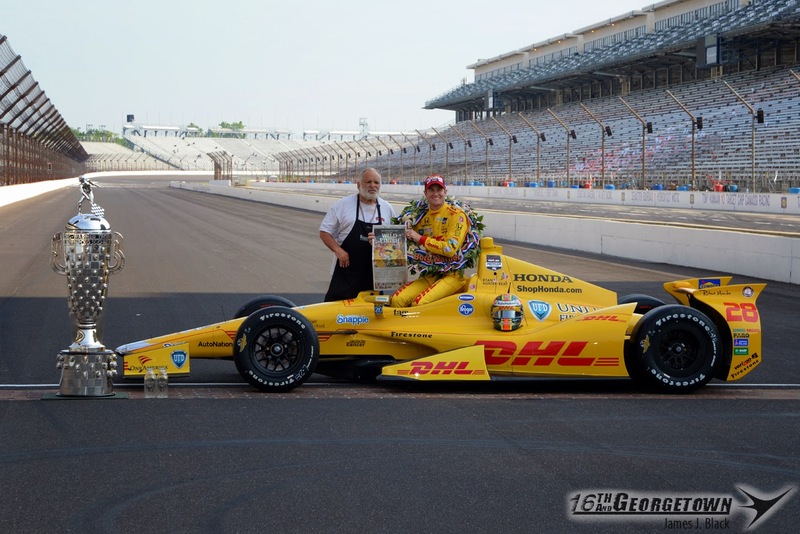 "It's a dream come true, man," said Hunter-Reay. "I can't even believe it. I don't know. This is just the most fantastic team for what they've given me. 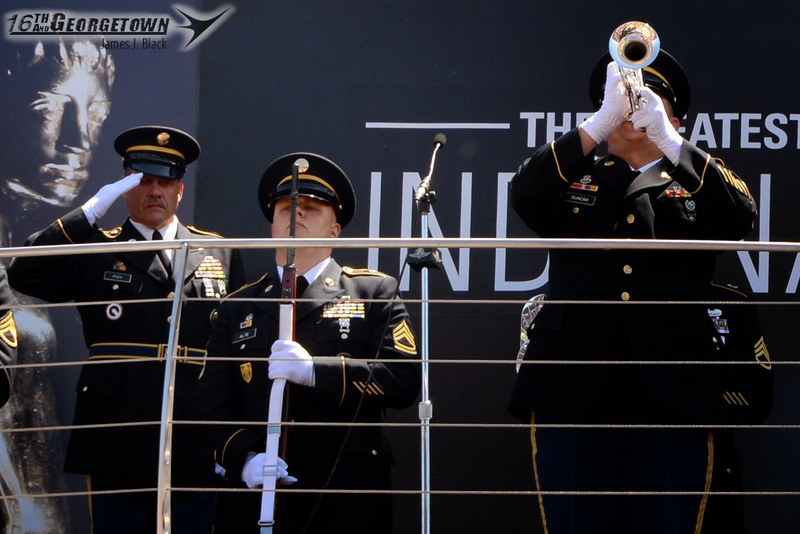 My dream has come true today and I'm a proud American boy, that's for sure." Following a Lap 191 caution for Townsend Bell into the Turn 2 wall, officials made the decision to drop the red flag with 7 laps remaining to clear the track and make repairs to the wall. 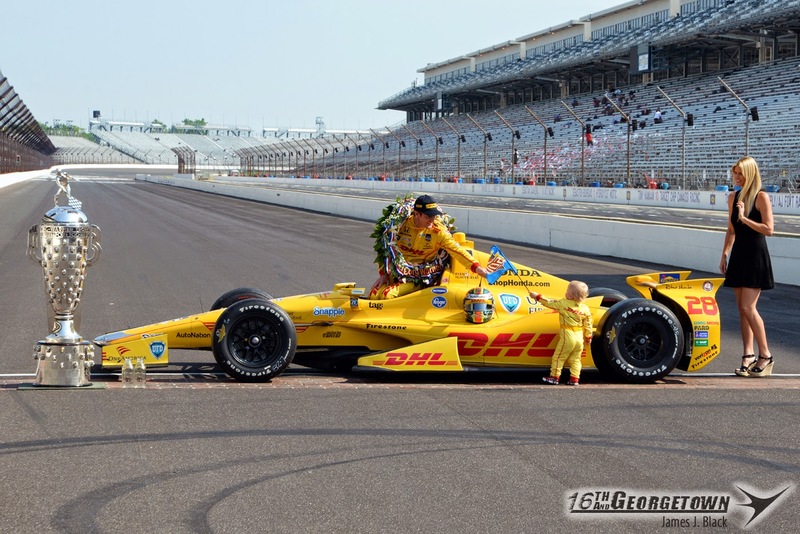 After a 10-minute delay, Hunter-Reay led the field to the green. 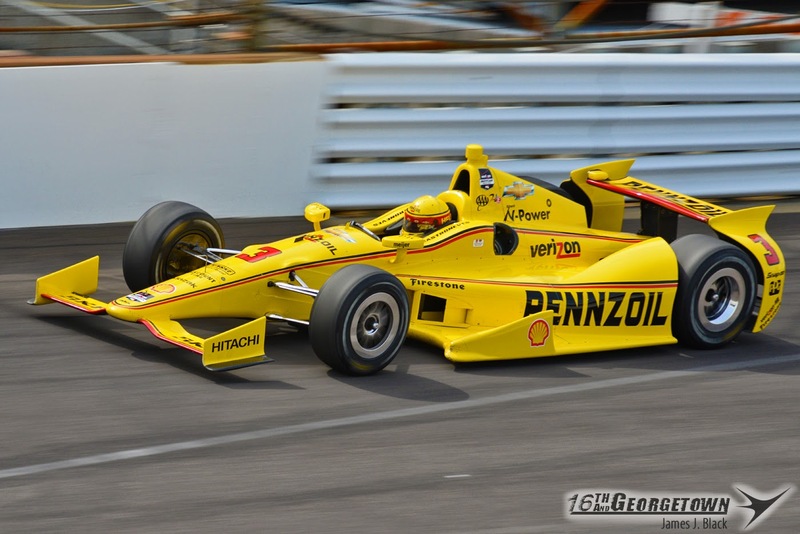 Helio Castroneves took the lead on lap 196, and Hunter-Reay returned the favor on 197. 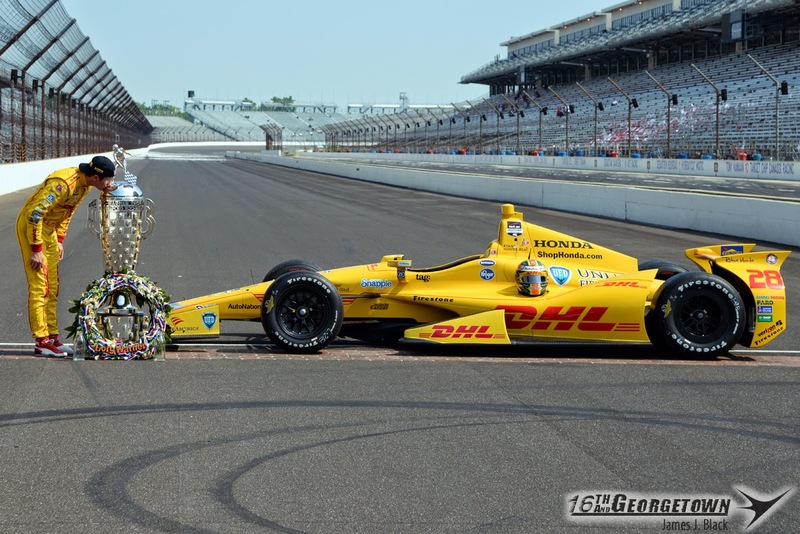 Despite a last straightaway move by Castroneves, RHR would hold the lead and add his face to the Borg Warner Trophy. 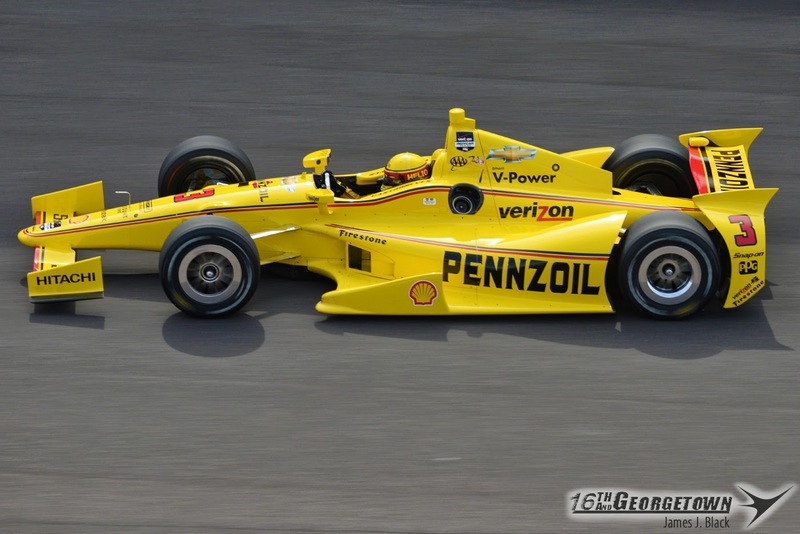 -With 38 laps led, Helio Castroneves jumped from 25th to 20th all-time. -With 16 laps led, Juan Pablo Montoya jumped from 34th to 32nd all-time. 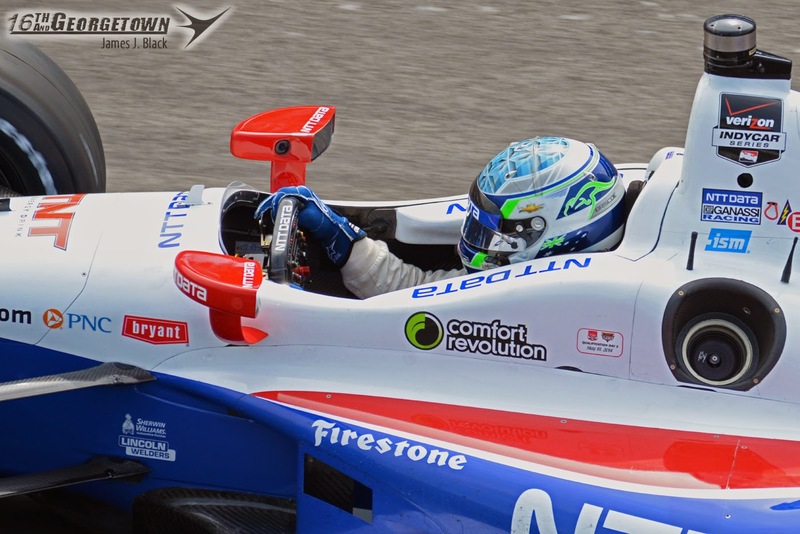 -With 20 laps led, Marco Andretti jumped from 51st to 40th all-time. 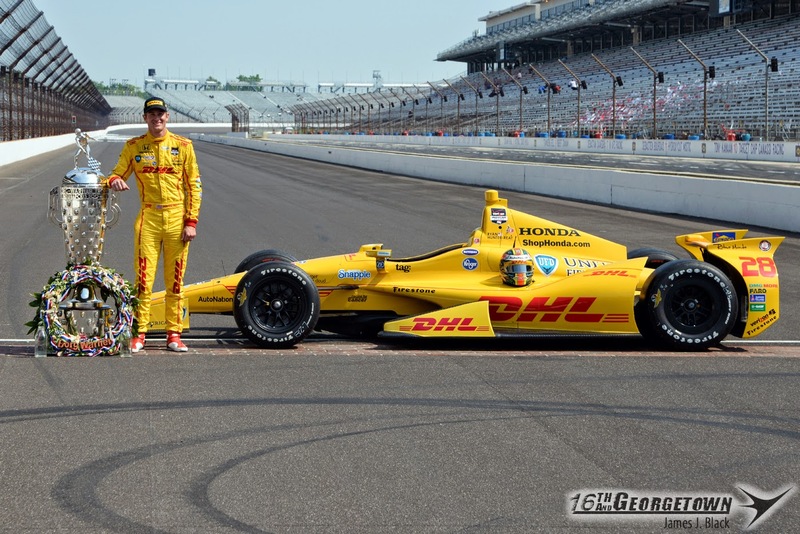 -With 56 laps led, Ryan Hunter-Reay jumped from 119th to 70th all-time. 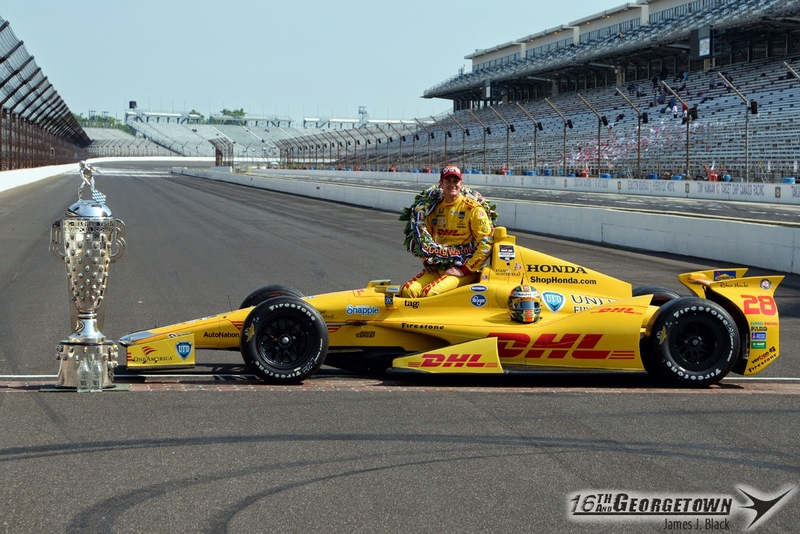 -With 14 laps led, James Hinchcliffe jumps from 144th to 119th all-time. -With 3 laps led, Alex Tagliani jumps from 123rd to 119th all-time. 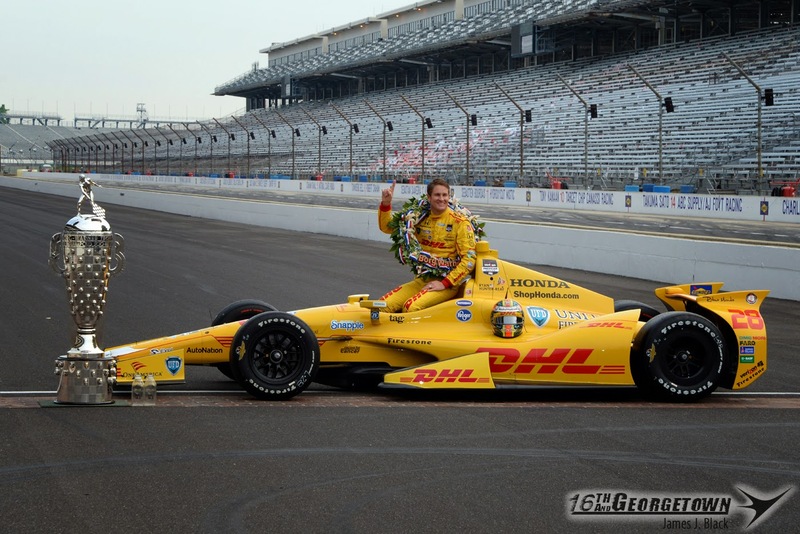 -Marco Andretti's 20 laps now ranks him 5th all-time laps led among non-Indy 500 winners. His father Michael is first. 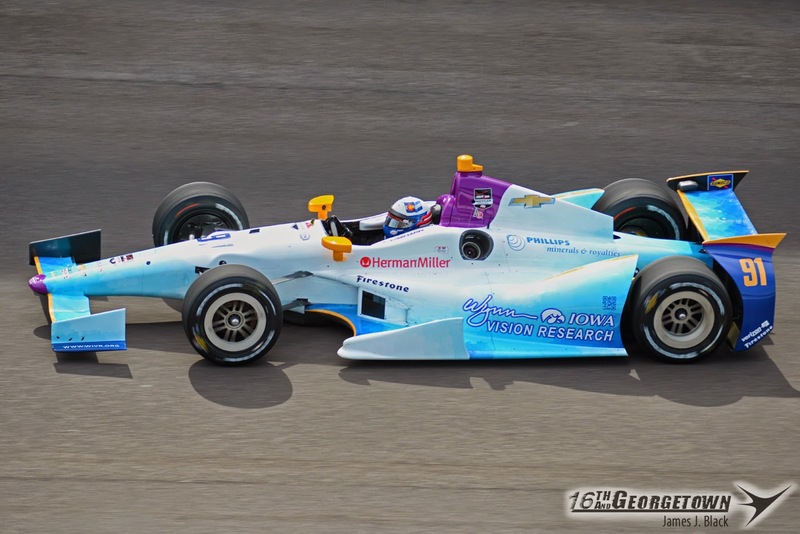 -Tony Kanaan led his 10th race, tieing Bobby Unser for 4th all-time. 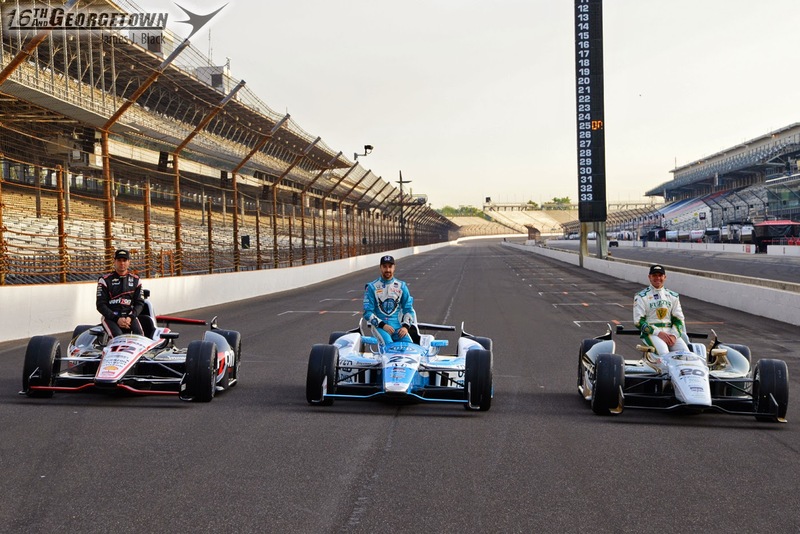 -Scott Dixon and Helio Castroneves both led their 9th race, good enough for 6th all-time. 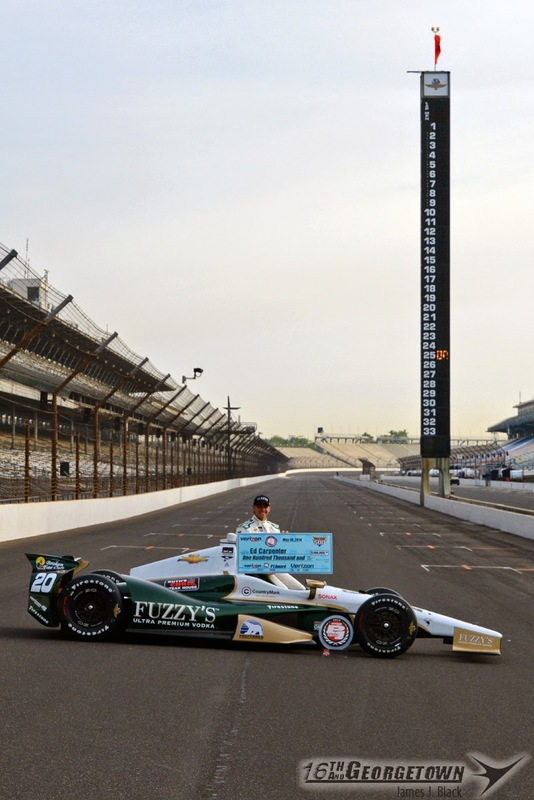 -Buddy Lazier needed 82 laps to pass Johnny Rutherford on the all-time mileage leader chart. He turned 87 and is now 6th with 6,992.5 miles. 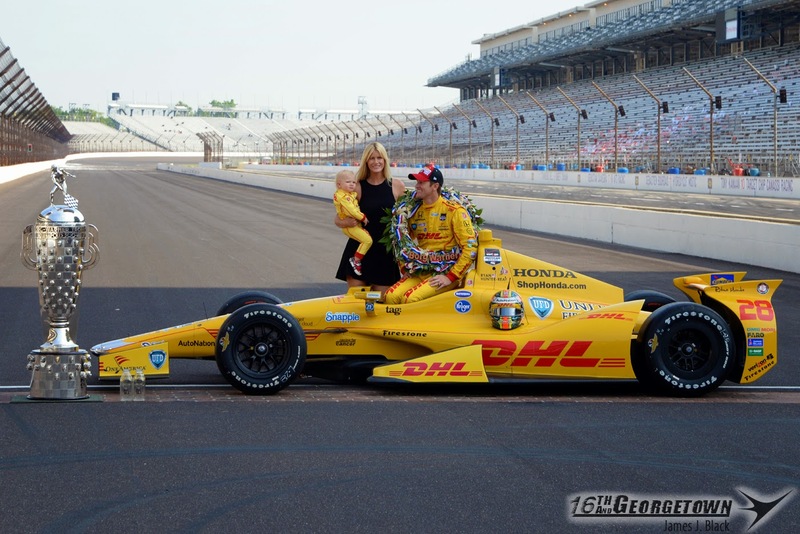 -Honda's win was their 10th, tieing Cosworth for 3rd most. 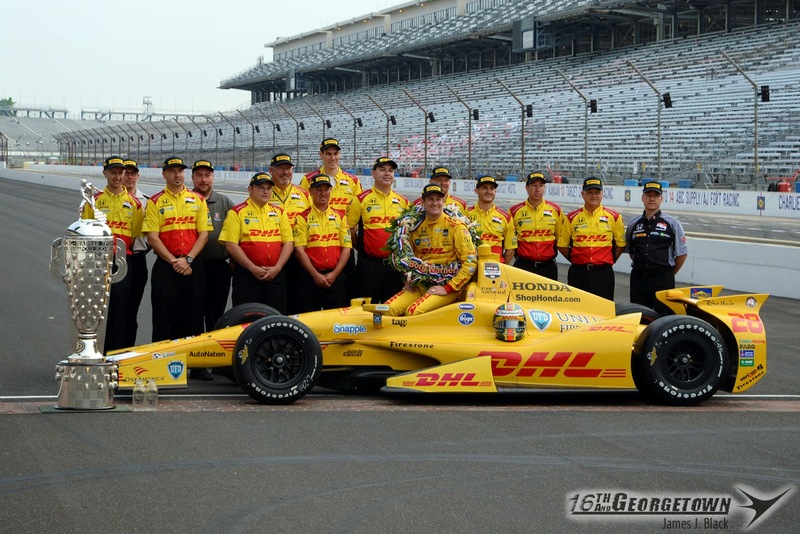 -Hunter-Reay's win in the No. 28 was the first for that car number in history. 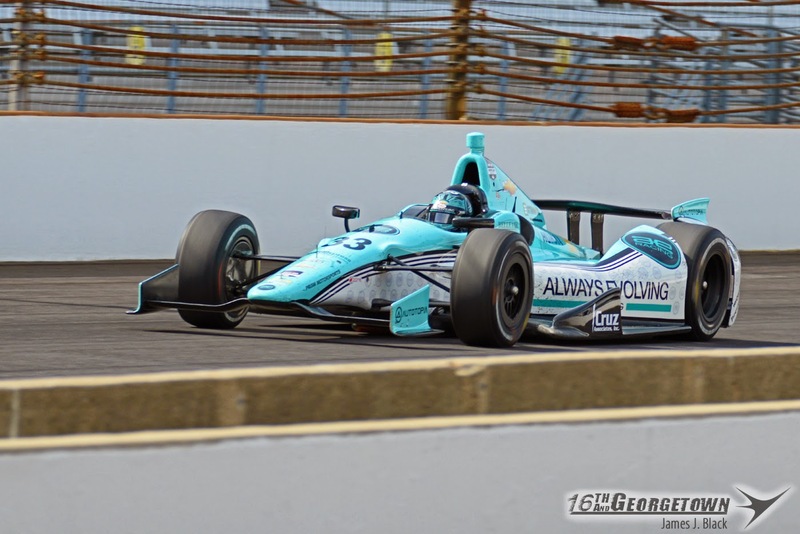 The final 1-hour Verizon IndyCar Series practice session prior to Sunday's Indianapolis 500 took the green flag just after 11 o'clock, and it was a busy one. All 33-car turned laps, totalling 1,441. 9.5% more than last year's Carb Day. 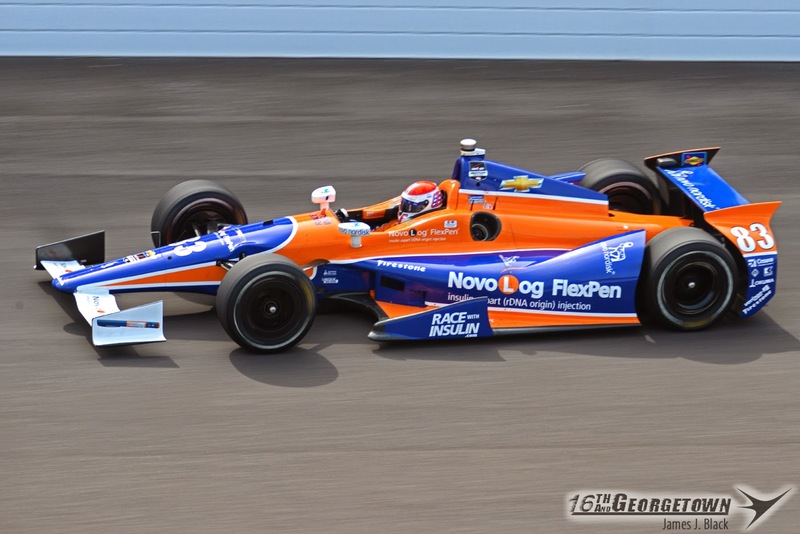 Ganassi teammates Tony Kanaan and Scott Dixon were quickest at 227.838 and 227.773 mph, respectively. 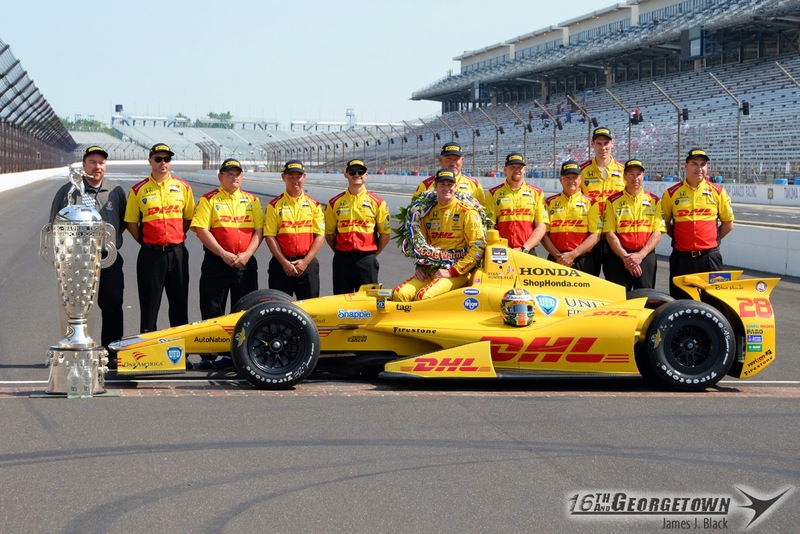 Townsend Bell, Helio Castroneves, Mikhail Aleshin, Ryan Hunter-Reay, Marco Andretti, Alex Tagliani, Juan Pablo Montoya and Josef Newgarden rounded out the top 10. The only yellow flag of the session dropped at 11:34 when rookie Sage Karam exited Turn 4 too high and made slight contact with the wall. Close to spinning, Karam regained control before major damage. Any suspension issues will be fixed and likely a new fire suit for Karam will be ready for Sunday. 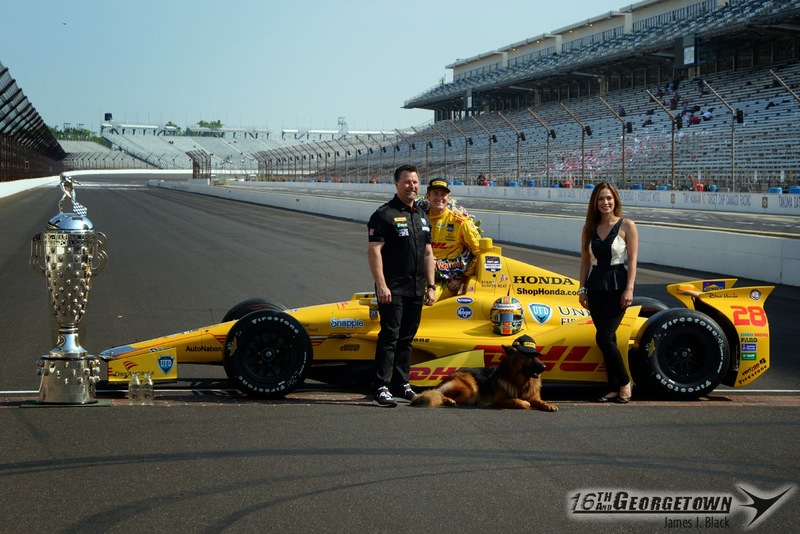 Ryan Hunter-Reay's session ended a bit early when an engine leak was discovered and a vibration in Andretti Autosport teammate Jame Hinchcliffe's No. 27 was found in the closing minutes of practice. 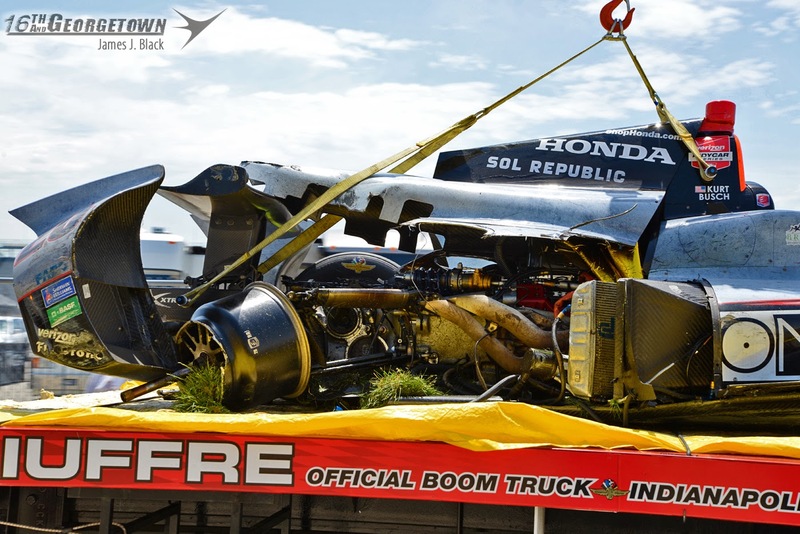 The green flag for the crown jewel of the Indy Lights season, the Freedom 100, was dropped just after 12:30. 11-cars, led by Luiz Razia took the flag. 15-laps into the 40-lap race, Belardi Auto Racing's Chase Austin lost control of his No. 0 Dallara entering Turn 1. Nearly regaining control, Austin's car slid sideways towards the inside of the Turn 1/Turn 2 Short Chute with the front end making side contact with a tire barrier. The car pivoted and contacted the concrete wall at a very high rate of speed, destroying the chassis. Austin was helped out of the car and into an ambulance where he was transported to the infield care center. According to Dr. Olinger, Austin never lost consciousness and suffered a fractured left wrist. He was transported to Methodist Hospital for further evaluation. Following an 8-lap caution, the race went back to green and stayed that way through the checkered. Belardi Auto Racing's Gabby Chavez was 2nd coming out of Turn 4 on the last lap, but caught a draft from leader Matthew Brabham and took the win by five one thousands' of a second (.005). 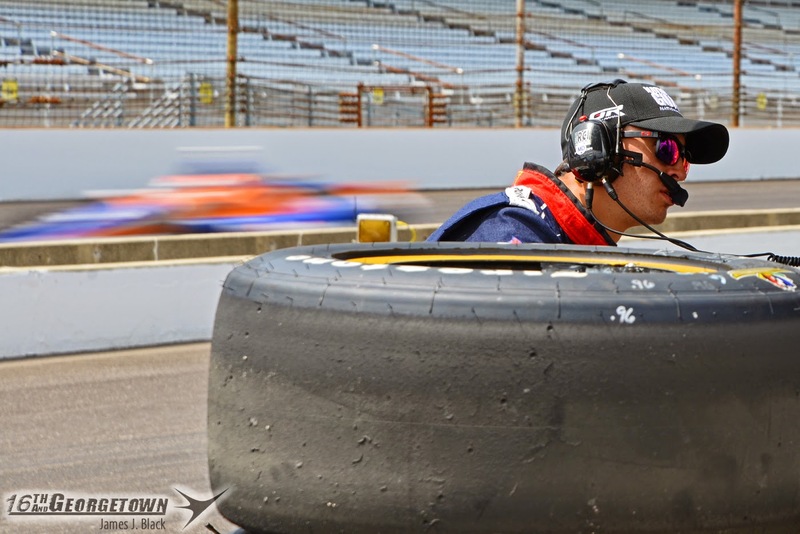 The Pit Stop Competition has ran 11 times over the last 12 years ('08 canceled/rain) and only 1 non-Indy 500 winning driver has won (Briscoe '11). 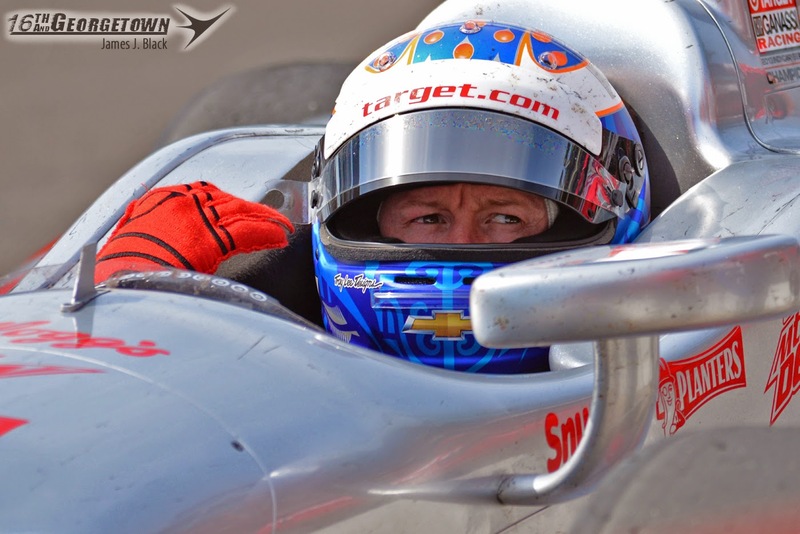 That streak continued in 2014, as Target Chip Ganassi Racing's No. 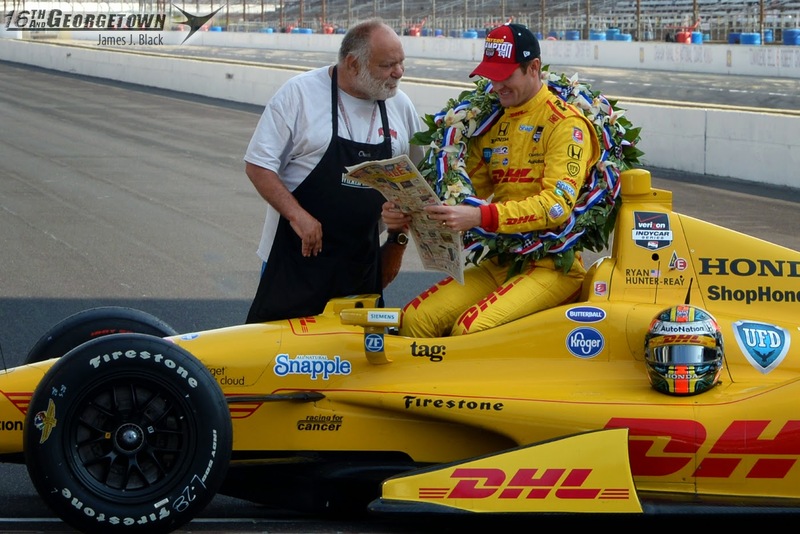 9 crew of Scott Dixon took the Tag Heuer Pit Stop Competition and the $50,000 prize. 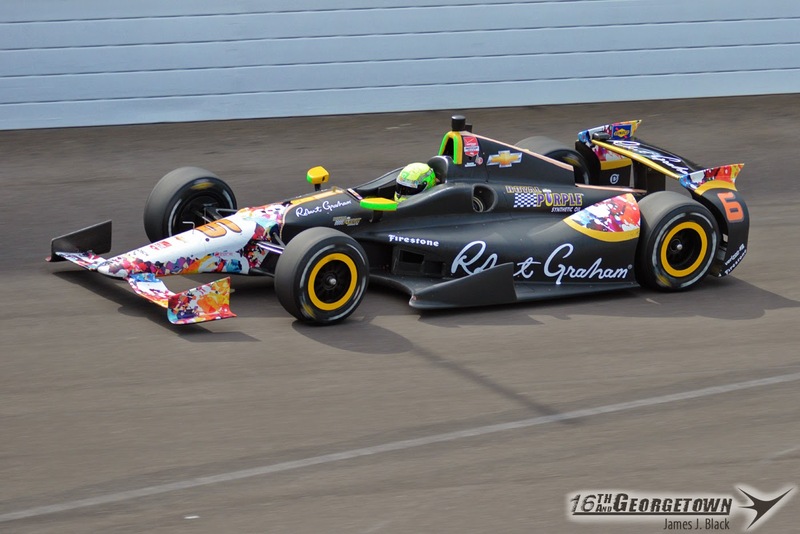 Sage Karam and his one-off Dreyer & Reinbold team finished 2nd in the 12-team, 4 round competition. The win was the 2nd all-time for a Ganassi-owned squad and the 2nd in three years. 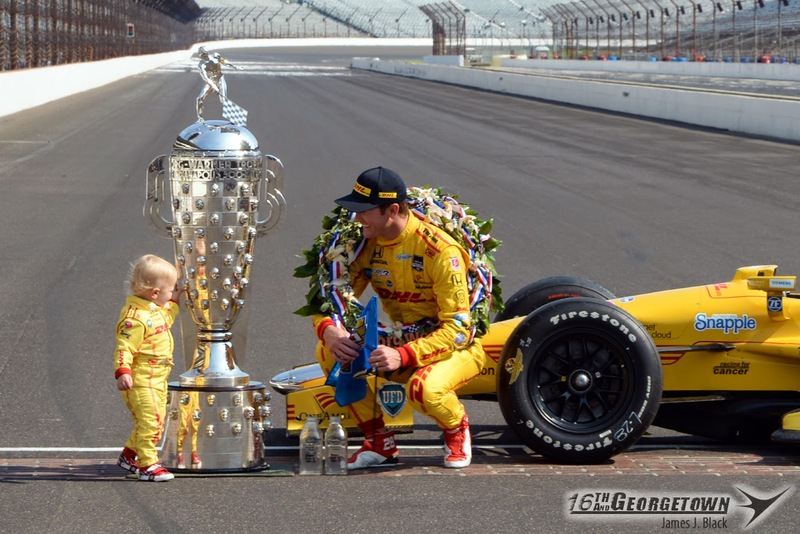 Dixon, who won in 2012 joins Helio Castroneves (6), Danny Sullivan (4), Al Unser Jr. (3), Scott Goodyear (2), Rick Mears (2), Johnny Rutherford (2), Jacques Villeneuve (2), and Buddy Rice (2) as multiple time winners. 8 of the 24 (33%) returning drivers from last year's '500' switched their winning milk preference. 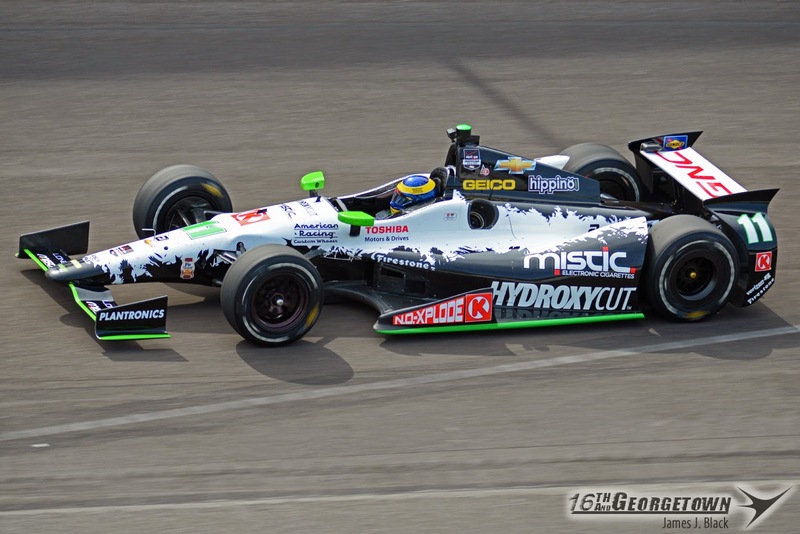 Townsend Bell, Sebastien Bourdais and Sebastian Saavedra changed from No Preference to Whole. 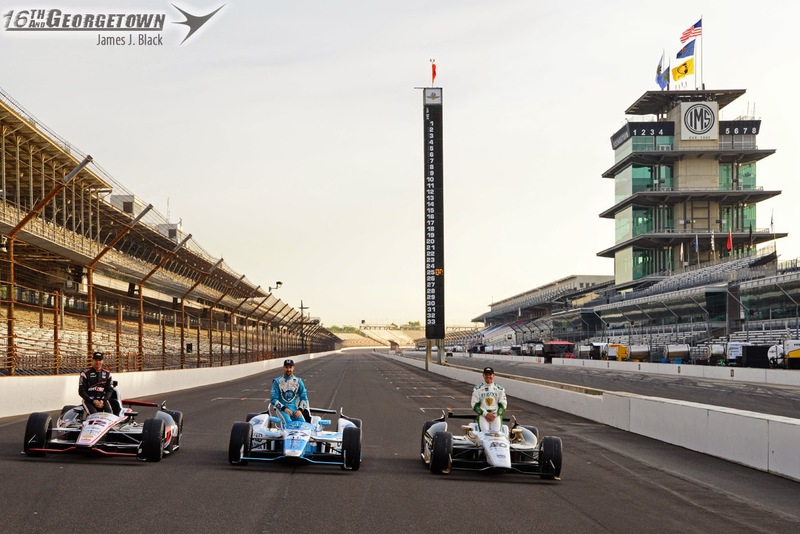 Scott Dixon and Oriol Servia made the switch from Whole to 2%. 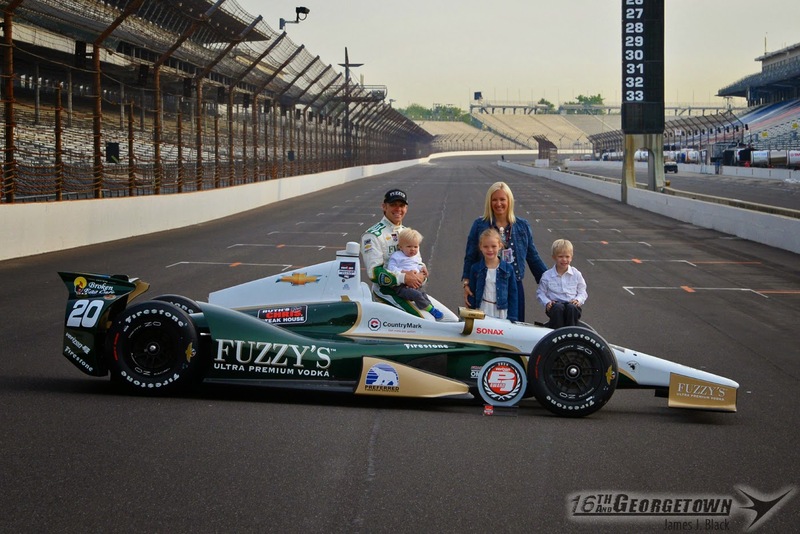 Carlos Munoz and Justin Wilson were 2% in 2013 and Fat Free this year while Ed Carpenter Carpenter changed it up from 2% to Whole in the off season. 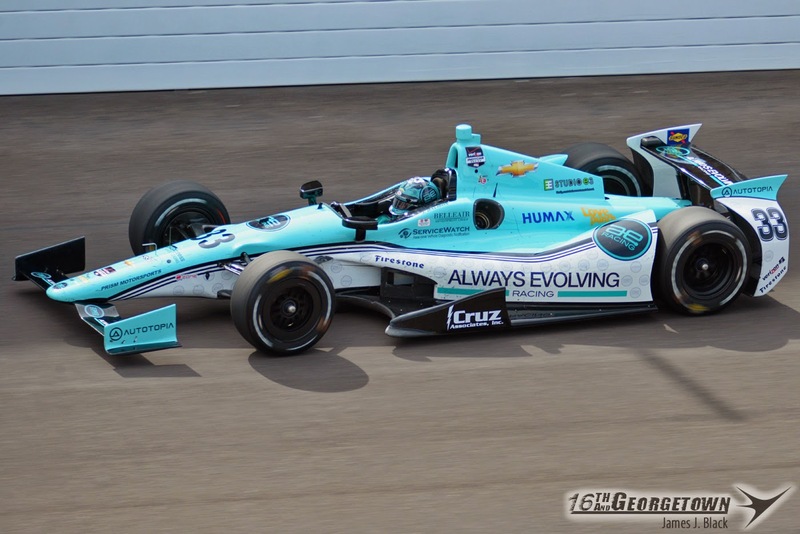 The other 9 drivers are made up of 7 rookies (Aleshin, Busch, Davison, Hawksworth, Huertas, Karam & Plowman) and 2 veteran drivers who did not compete in last year's race (Montoya & Villeneuve). 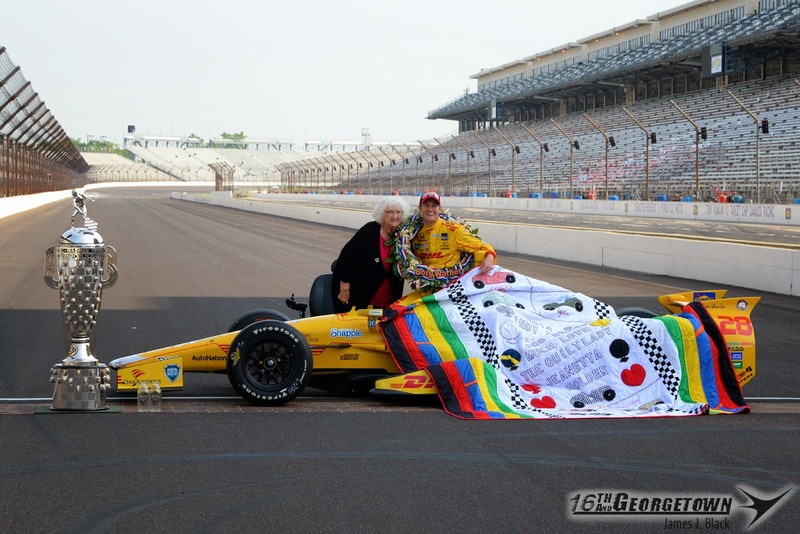 Firestone announced that Mario Andretti has won the inaugural Firestone Legends of the Indianapolis 500 Award. The award is given to 'individuals who have helped define and contribute to the legacy of the "Greatest Spectacle in Racing"'. 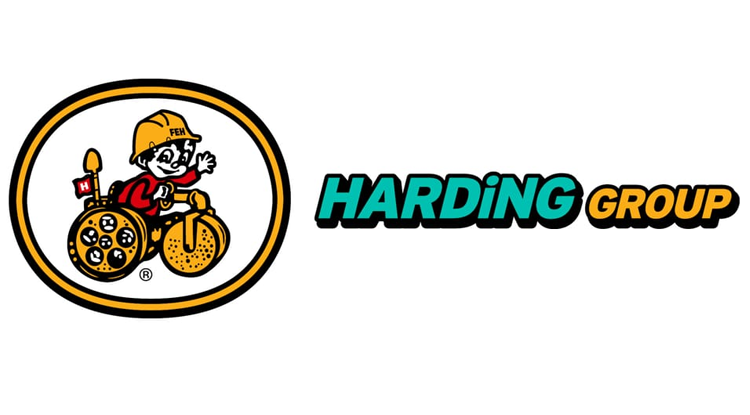 A $20,000 donation to the Fund to Benefit Children & Youth in Andretti's home of Nazareth, PA will be given and a presentation will be made to Andretti at the Saturday Public Driver's Meeting. 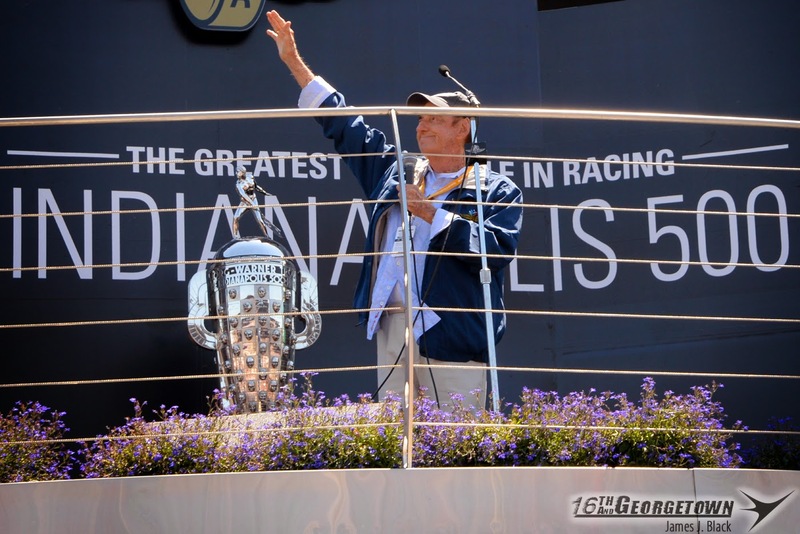 Singing 'Back Home Again in Indiana' for the last time, Jim Nabors has been named Grand Marshal for Saturday's IPL 500 Festival Parade in Downtown Indianapolis. 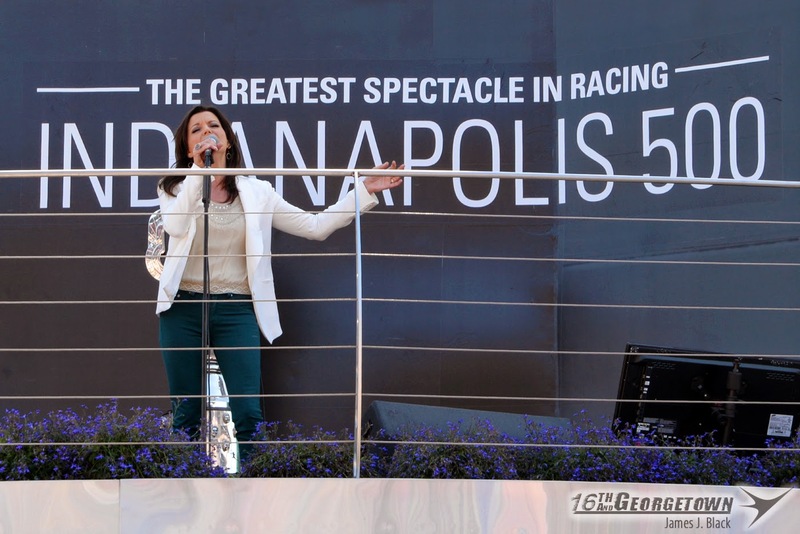 In addition, Nabors will hold a question and answer session at 10:30am in the Pagoda Plaza on Carb Day followed by a Meet & Greet with fans. Wristbands will be distributed at 9am. 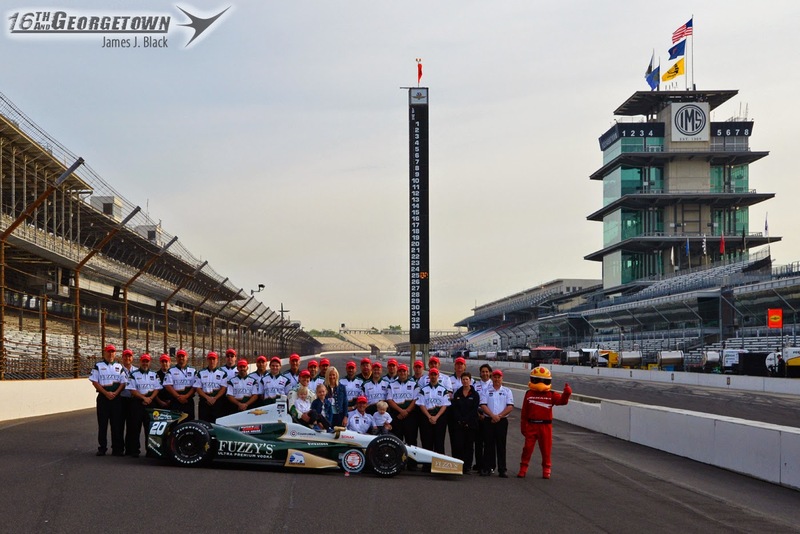 Indiana Governor Mike Pence, Hulman & Company CEO Mark Miles, Dallara owner Gian Paolo Dallara, Sarah Fisher and A.J. Foyt were on hand at the Dallara IndyCar Factory in Speedway this morning for a ribbon cutting of the new Dallara D3 simulator. Available to teams, engineers and drivers, the 180-degree video screen and surround sound emulate exact track configurations and conditions. 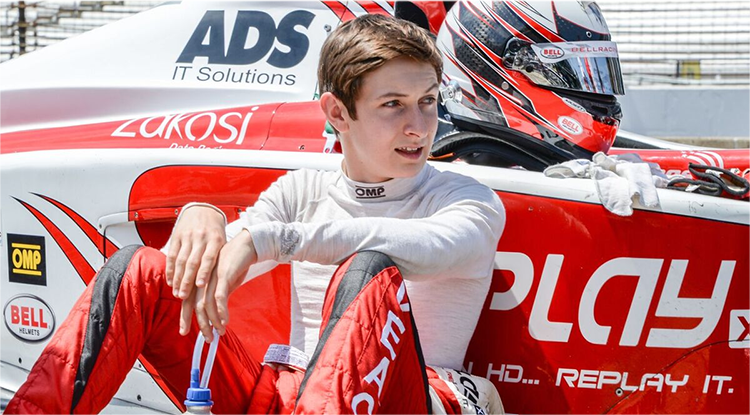 The 12-car Indy Lights field dwindled to just 11 this morning when Team Moore's entry for Emerson Newton-John was withdrawn due to sponsorship issues. 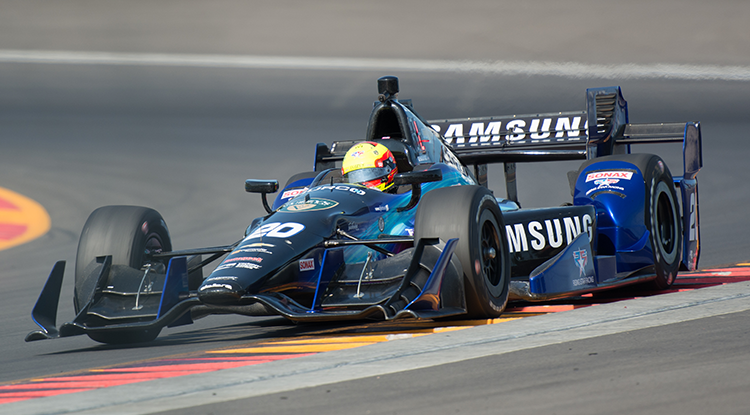 Following a 3-hour morning practice, the Indy Lights Field ran their qualification session with Schmidt Peters Motorsports w/Curb-Agajanian driver Luiz Razia taking pole. The seventh and final practice prior to Carburetion Day is in the books and it was a busy one. The entire 33-car field hit the track, totalling 2,329 laps in less than 4 hours of green flag action. 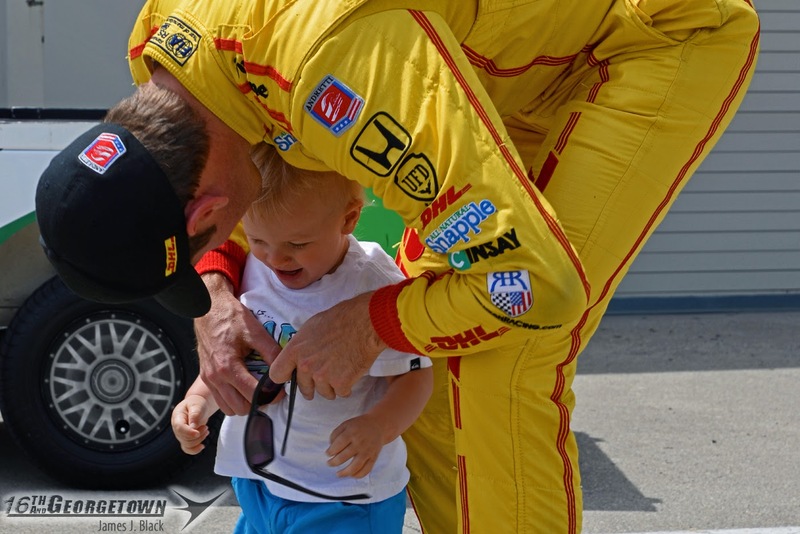 Some of the biggest news of the day came early in the session when at 1:34 Andretti Autosport's Kurt Busch made hard contact with the right side of his No. 26 Honda in Turn 2. “I was starting to feel comfortable," explained Busch. 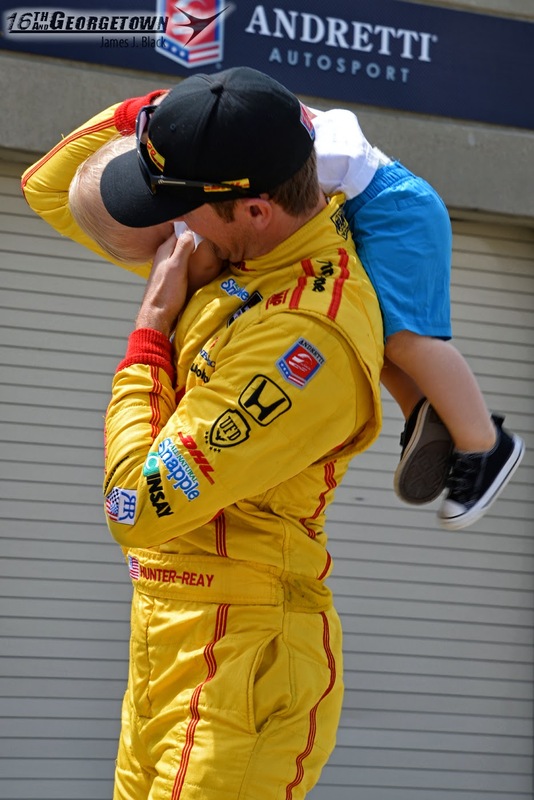 "That’s when I made the mistake of just letting my guard down or settling into that long run type mentality whereas with an Indy car you have to be on edge. You have to keep track of where you are at all times and the adjustments in the car. Maybe I just didn’t keep up with keeping the car underneath me. 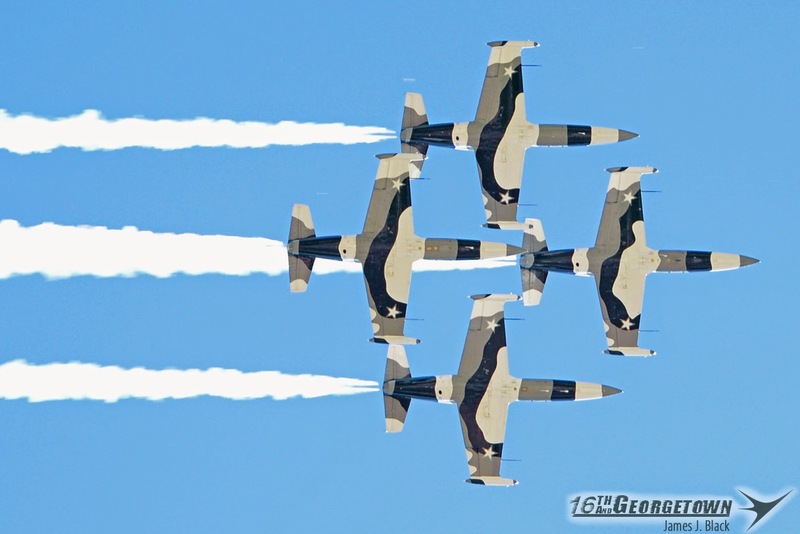 Trying to get into that rhythm and feel other things around you and I got behind on my adjustments in the car." Busch's car appeared to lose it's rear end while exiting the apex of Turn 2 when the full-time NASCAR driver attempted to correct but was too late. Luckily for Busch and his team, the right side of his DW-12 made contact with the tapering off SAFER Barrier. Busch climbed from the car and was taken to the infield care center where he was evaluated, released and cleared to drive. 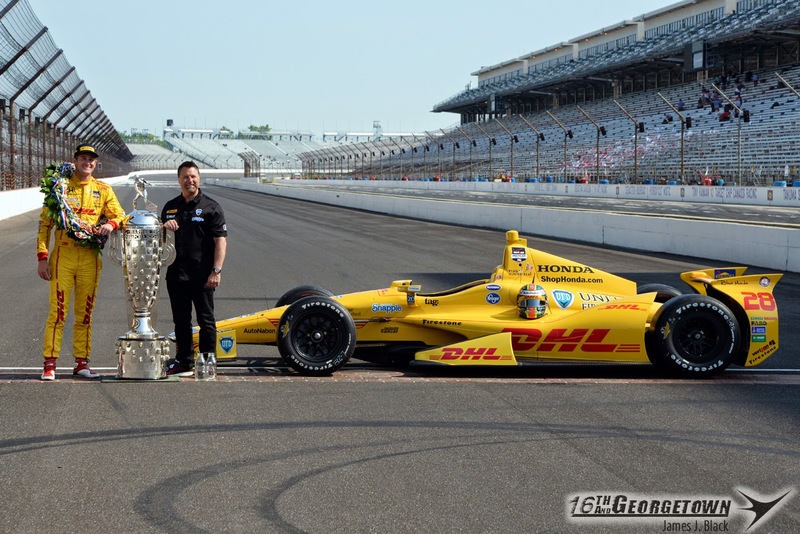 Kurt Busch's car was transported to the Andretti Autosport shop where it was to be re-built for the '500'. Unfortunately for the team, the car is not repairable in time for the race so he'll use Marco Andretti's backup entry. Per INDYCAR Rules, Busch will keep his 12th place starting position. 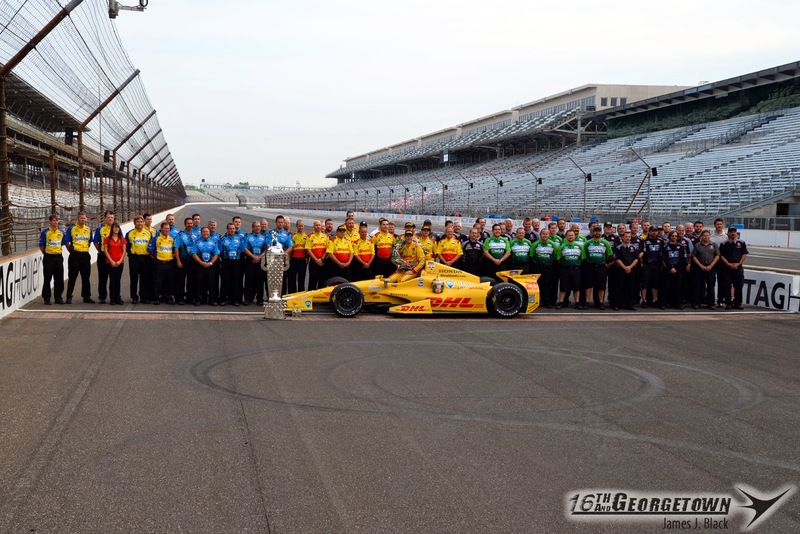 The day was kicked off at 7am in Turn 1, where the annual Front Row Photo Shoot took place (Photos below). Just minutes after the shoot, the Indianapolis Motor Speedway sent a press release announcing a Stadium Super Truck race Carb Day afternoon. The Menards at the Brickyard Formula Off-Road by TRAXXAS race will utilize the frontstraight and portions of road course. The green flag will drop on the Robby Gordon founded series at 4:30, following the Pit Stop Competition. 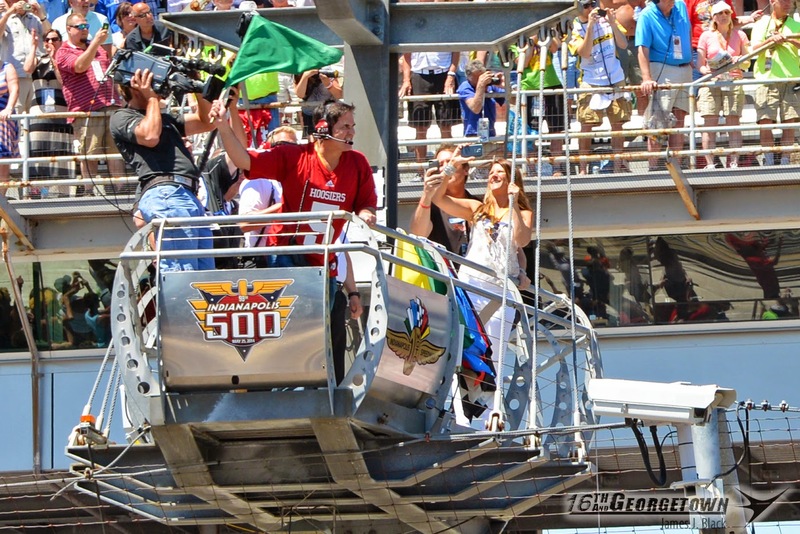 Later in the morning, IMS announced that Dallas Mavericks owner, Mark Cuban, will wave the green flag for the 98th Running of the Indianapolis 500. Cuban is an Indiana University graduate and Shark Investor on ABC's Shark Tank. "I am excited to come back to Indiana, not just to attend, but actually participate in this historic race," said Cuban.